We are the farthest north and west heli-ski operator in the world! Our winter playground lies just over 100 miles south of the arctic circle and east of the international dateline. During ski season we enjoy generally stable snowpack, sunny weather and long days. Nome, Alaska is known for the gold rush, the Iditarod, and chilly arctic winds, but come April it’s a skier’s paradise with untouched terrain. Join us in Nome, get off the established bootpack, and make your own tracks in remote arctic backcountry. Whether you are a professional skier looking for first descents, or you’re just learning backcountry techniques, we have terrain for everyone. It is not necessary to have any previous heli-ski or backcountry experience to enjoy a trip with us! Our trips are week-long and feature either helicopter skiing, or snowmobile-assisted backcountry skiing. On your arrival day you’ll be familiarized with our snowmobiles and take a short ride to our property north of Nome where comfortable cabins await. For the next six days, you’ll enjoy scenic helicopter flights and/or snowmobile rides from the backyard to the mountains and spot bear, moose and musk oxen along the way. Along with our guides and pilot, you’ll be a part of selecting runs, from big easy untracked spring cruisers, to steep and narrow couloirs. Guides will mix in a few favorite runs and pioneer some new ones, all while matching the terrain to your level of skiing. Evenings are spent in our comfortable hosted cabin accommodations featuring excellent meals, beer, wine and cocktails, and even a wood-fired hot tub. This is sure to be a trip you won’t forget! Do I need my own ski safety equipment? I have never ridden a snowmobile before. Is that a problem? No. Cell service from AT&T and GCI are available in Nome, but not out in our valley. We can also snowmobile or fly to the top of a nearby mountain for emergency cell service needs. We have a satellite messenger and satellite telephone at camp that also may be used for calls as needed. Our ski season is late March and early April. While temperatures and windchills can certainly still plummet to -30F, it’s quite unusual. Expect normal nightly lows of -10/10F and daytime highs of 10/30F. While normal ski gear works perfect for skiing here in spring, we have large parkas and winter boots available to those who are not well equipped for the low temperatures during snowmobiling or other activities. Our pilots fly year round in Nome for Bering Air and are held to the highest standards by the company and the Federal Aviation Administration. Bering Air has an impeccable safety record since 1979 in many types of helicopter and fixed wing operations. You will receive a detailed helicopter safety briefing and we’ll take care to keep you safe throughout the week. 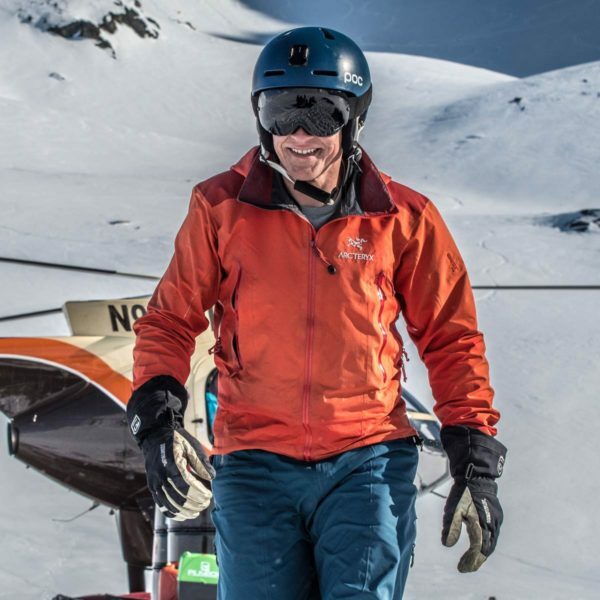 Your guides fly and work around helicopters not only for skiing, but also for wildlife survey and capture, remote refueling, long-lining, and many other tasks. You are welcome to use your own safety equipment, so long as we have checked it and find it acceptable. We will provide you with an avalanche airbag backpack to use, as well as a beacon, shovel and probe. Upon arrival at camp, you will be issued this gear and can familiarize with it. On our first ski day, we will train you in its use and do a sample search and retrieval following accepted practices. Your guides are born and raised Alaskans who lived parts of their lives in remote cabins, cut their own firewood, slept in snow shelters “just for fun”, hunt, fish, and travel the backcountry in their ski planes and on snowmobiles, rafts, boats and skis/snowboards. We know the country and are intimately familiar with the risks present, and not only how to survive it, but how to be comfortable doing so. Guides are certified in First Aid and CPR, as well as backcountry route finding, and avalanche avoidance and recovery, . On each outing we carry appropriate first aid equipment, as well as satellite communication equipment. We monitor weather, snow and lighting conditions as we travel to make our trip safe, comfortable and enjoyable. No. Our snowmobiles are easy and comfortable to ride. We will show you all the features and how to drive them, and we’ll drive at a speed comfortable for the slowest rider. We don’t do any technical riding. Guides in general will have put in trails before your use and checked for the safest way to travel. Yes! Northern lights, also known as Aurora Borealis, are often present during our skiing season in April. On very clear, calm nights around 2-3am they sometimes can be spotted right off the deck in the northern sky. $2000 is required to make a reservation. The balance is due by November 15 prior to your ski trip. If making the reservation after November 15, the total trip cost is due to hold the reservation. Total trip cost minus a $500 cancellation fee from each person is refundable if the trip is cancelled prior to November 15. If cancelled after this date, no refund is available unless we can resell the week, and you will be responsible to pay the entire cost. • First Class ask us for a quote! Nowhere else can you get a first descent, much less a dozen in a week!